As they did for the current S550 generation of the Ford Mustang, the go-fast experts at Roush Performance have created an active-valve exhaust system for the 2015-2018 Ford F-150, allowing drivers to exercise control over just how much growl is coming out of their trucks with the flip of a switch. 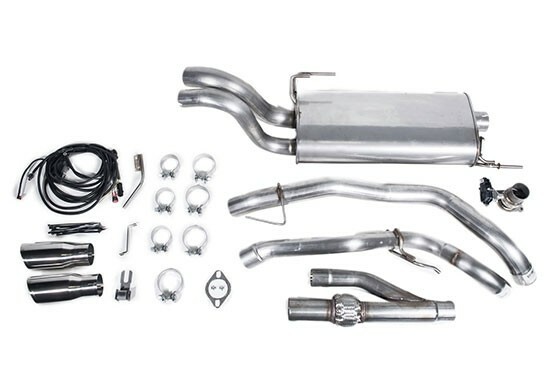 The Roush Active Cat-Back Exhaust is listed at $1,899.99 on the company’s website, and will fit any non-short-cab 2015-2018 Ford F-150 powered by Ford’s 3.3L Ti-VCT V6, 2.7L EcoBoost V6, 5.0L Coyote V8, or 3.5L EcoBoost V6 – so long as it isn’t a Raptor. The kit comes with a toggle switch that installs in the cabin for immediate switching between fully-closed and fully-open valves, allowing the driver to quiet down the exhaust note for late-night and early-morning drives through the neighborhood, or uncork it for spirited romps on the freeway. Even with the valve closed, drivers will notice a nice, throaty exhaust sound that’s more aggressive than stock, thanks to a Roush-designed high-flow muffler. Gasses exit through a pair of 4-inch stainless tips with the Roush logo etched in, and the tubing is made of T-304 stainless, so it ought to last. Just in case, the cat-back exhaust kit comes with a limited lifetime warranty. Above, you can hear the difference for yourself, as a Coyote-powered Ford F-150 demonstrates the sound of the Roush Active Cat-Back Exhaust with the valve at first closed, and then open. For more information, or to place your order, visit RoushPerformance.com.